The warmer months of the year are typically the most popular time to get married. Chances are you’ll participate in a few weddings this summer as well – statistically, more couples get married in June than in any other month of the year (Assuming you are in the Northern hemisphere). So now’s a great time to explore some particularly stylish wedding themes and ideas. Of course, we wouldn’t be called Pearls Only if all of these ideas didn’t revolve around pearls! Pearls have been used in jewellery and decor for centuries, so just like silver or gold they can find their place in any wedding. However, some themes come with much more uses for pearls than others. We’ll have a more thorough look through all the ways of adding an extra layer of subtle elegance to a wedding later on, but let’s begin with a few fashionable wedding themes which just cry for the inclusion of pearls. Vintage weddings have been popular for quite a while, but it took the 2013 adaptation of The Great Gatsby to really bring the années folles – the crazy years, as the French call them – back to life. 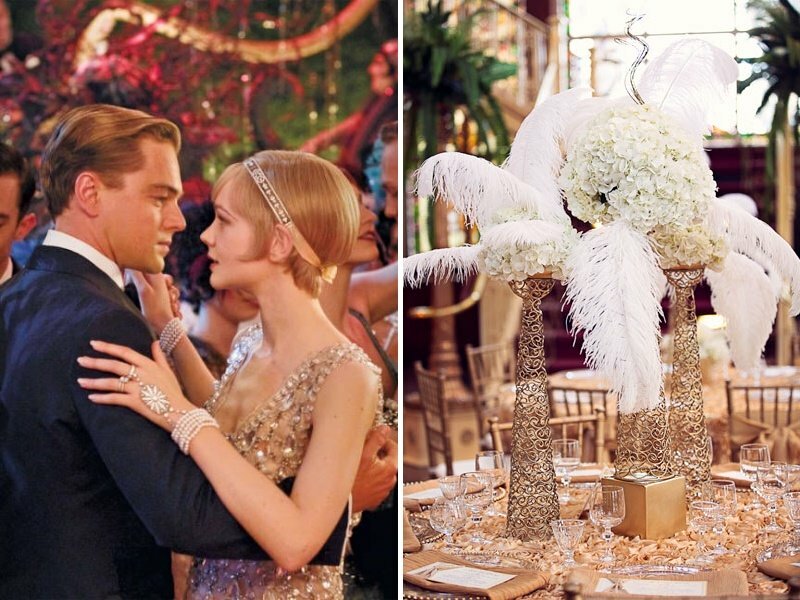 Large mansions, geometric decor, dapper suits, glittery dresses, champagne towers, flouncing feathers, and the never-ending celebration of life – everything you enjoyed in the movie can find its place in a Gatsby-themed wedding. Pearls were particularly popular during that wild decade and were frequently used to adorn headbands, pearl bracelets, pearl necklaces, dresses, and shoes. At a wedding, they can also be used to decorate chairs, table centrepieces, or candles – “excessive” isn’t a word you’d find in Jay Gatsby’s vocabulary! The 2011 Royal Wedding was watched by around 300 million people around the world, so it’s not surprising that plenty of couples decided to get married in a similar fashion afterwards. After all, you don’t have to be a member of a royal family to have a royal-like wedding. All you need is a sense of luxury and sophistication created by timeless decor, classy attire, and a fitting location. The Queen wore a pearl necklace to the Royal Wedding, once again showing the everlasting appeal of pearls. In a royal-inspired wedding, pearls can also add some elegance to the table decor pieces, napkins, chairs, and chandeliers. Whether it takes place on the Atlantic coast or on an island in the middle of nowhere, a beach wedding is always a special occasion. Good weather is probably the most important prerequisite for a nice nautical-themed wedding which takes place outdoors, but some refined local decor can add a layer of sophistication to the rather casual (yet very romantic) setting. As pearls grow underwater, it’s only natural to use them to add some shine to jewellery or sandals for a beach wedding. For the reception, pearls can also be mixed with seashells, starfishes, and sand to create unique table centrepieces and decorations. Pearls can make any wedding just a little bit more elegant and classy, but it’d be rather difficult to pull off one of the themes above without using pearls for attire or decor. So what are some particular uses you can find for pearls during a wedding? There are quite a lot of them, so let’s break the ideas up into five groups: attire, flowers, decor, presents, and food. There are hardly any limits when it comes to using pearls for the bride’s wedding day attire. The dress, shoes, Pearl necklaces, pearl bracelets, pearl earrings, headbands, or hairpieces can all become way more elegant if they’re adorned with pearls. Pearls never go out of style, so they’re suitable for almost any wedding theme you can think of. However, they’re essential for a Gatsby-themed wedding – we can hardly imagine one without the bride and the bridesmaids perking themselves up with some gorgeous pearls. The hairpiece, shoes, and wedding dress sleeves above all demonstrate how a few fairly simple pieces of attire can create a chic and luxurious atmosphere. The bride’s bouquet is one of the main symbols of the wedding, so every bride wants hers to be as beautiful and eye-catching as possible. That’s why modern bouquets tend to look more like works of art rather than traditional flower combinations. So decorating the bouquet with pearls is always an excellent idea. The photos above show a few different ways of doing that: pearls can be used as a handle around the stems or combined with the flowers themselves. More daring brides can also choose to exchange real flowers for a unique bouquet made entirely out of pearls. This might serve as a huge step towards making the wedding truly unforgettable. Another area where you can find plenty of uses for pearls is the reception decor. It’s up to your imagination, as pearls tend to look good anywhere you put them, but some uses are more common than others. Strings of pearls look great if you use them to decorate chairs, chandeliers, birdcages, or larger table centrepieces. Individual pearls can also look great on name or table number cards (we love the idea above) and around candles. For a more thorough look, pearls can be combined with other decor elements, including flowers, twigs and branches, pebbles, seashells (great for beach weddings), or burlap (for shabby chic or rustic weddings). If the bride decides to spruce herself up with some pearl jewellery, it might be a good idea to present her bridesmaids with a simple pearl-adorned bracelet or Pearl necklace. This kind of present looks great on the big day, serves as a reminder of the wedding throughout the years, and can be reused at a later time – once again, pearls never get old. Personalizing the jewellery or adding a sweet little message as shown in the photos above can surely make the bridesmaids even happier. It’s a great way to ensure that they’ll remember the wedding forever! Adding real pearls to the main course might be a little over-the-top even for a Roaring ‘20s wedding, but they can certainly be used to decorate the wedding cake stand and topper. More often than not, traditional wedding cakes feature edible pearl-like decor elements. If other desserts such as cupcakes or macaroons are served at the reception, they can also be decorated with similar pearl designs. If pearls are used to adorn the entire wedding, it’s only natural to see some beautiful white round decor elements on the food as well. After all, the desserts are there for two purposes: to be delicious to eat and gorgeous to look at. All in all, it’s clear that pearls can add a sense of luxury, elegance, and sophistication to any type of wedding. Regardless of the chosen theme, there are countless ways to use pearls to add that tiny subtle touch which can improve the entire atmosphere. For those of you who have already tied the knot, you may be interested in our wedding anniversary gift guide. It covers years 1 to 60 with detailed ideas and suggestions as well as a romantic quote that you could use in an anniversary card. This entry was posted in PearlsOnly and tagged pearl wedding cake, pearl wedding dress, pearl wedding presents, pearl wedding theme by PearlsOnly Team. Bookmark the permalink.